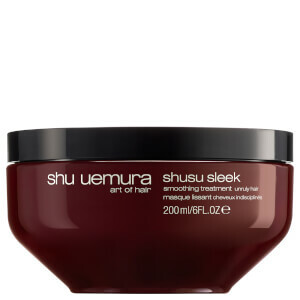 Shu Uemura Art Of Hair Shusu Sleek Masque (200ml) helps to create long-lasting sleekness with the help of extra Black Cumin oil. Working to nourish and detangle hair, the rich and creamy texture works deep into the hair to allow a resplendent finish of Japanese satin. Aqua / Water, Cetearyl Alcohol, Amodimethicone, Behentrimonium Chloride, Glycerin, Cetyl Esters, Isopropyl Alcohol, Candelilla Cera / Candelilla Wax, Trideceth-6, Nigella Sativa / Nigella Sativa Seed Oil, Caprylyl Glycol, Benzoic Acid, Cetrimonium Chloride, Alcohol, Hexyl Cinnamal, Safflower Glucoside, Caramel, Gentiana Lutea Extract / Gentiana Lutea, Root Extract, Ci 15510 / Orange 4, Parfum / Fragrance.